You give an online demo of your product to a potential customer, and do your best to wow her with all the features and awesome functions of your product. The demo comes to an end, and she signs off with a polite “thank you, this was insightful, I’ll discuss this with the team”. Then… nothing. She goes silent, doesn’t return your calls, and you slowly begin to realize that noncommittal response was effectively a “no”. What went wrong? This prospect was qualified, and interested enough to schedule time in her busy day to attend a demo. Why did she just disappear? In this post, you’ll learn the most common reasons why demos fail, how to avoid them, and how to win more deals by giving more successful demos. It’s not about how your product will help your prospect in a step-by-step manner. She doesn’t want to become an expert on how to use your product. Just show her enough to make her believe your product can help her achieve what she wants. Don’t get lost in the details, don’t make her endure an endless parade of narrated mouse-clicks. Instead, get your prospect to envision how her life will be better once she buys your product. It’s about making a sale, not about teaching her how to use your product. Don’t be an amateur. Take a few minutes in advance to open various tabs and windows you’re going to show. It will save just a couple of mouse clicks and a couple of seconds of load time, but for a busy prospect dying for you to get to the point that makes a difference. Your time with your prospect is limited. Why would you squander it by making her wait for pages to load? Her time is too valuable to watch you navigate your way through a menu to find a certain feature window in your app. Having the windows already open creates a visceral impression of speed and efficiency. And in case the internet slows down to a crawl, you can still keep demoing. Know your way around your presentation software. If you haven’t practiced, do a test run with a colleague. Make use of different features of the software so that you know what happens on the other person’s screen. Also, make sure that no chat or call notifications pop up on your screen when sharing it with the prospect. If you want her undivided attention you need to give her yours. Who will attend the demo? Find out who is actually watching the demo. Is it just the person you scheduled it with, or will someone else be present? If so, what’s their role? What do they care about, what objections and objectives do they have? Keep in mind these may not perfectly align with those of your original contact. An end user, for example, will typically be interested in very different things than a senior level executive. Before you start the demo, re-state how long it will take and what the primary objective is, even if you’ve previously already agreed on this. Tip: Want to earn bonus points? Finish early! Most product demos go over time. If you can plan your demo to finish five to ten minutes sooner than planned, and end on a high note, your audience members will be happy about it and appreciate it. Stop selling when the prospect is ready to buy. Those slides about your company? Delete them. A product demo isn’t the time and place to talk about your corporate history, your team members’ education, and logos of your customers. That’s for another time and place. 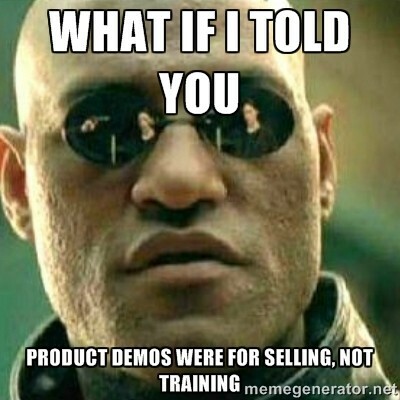 What’s a product demo really about? It’s not about the product, its features or functions. Your prospect shouldn’t need to attend a live demo to learn about the features of your product. 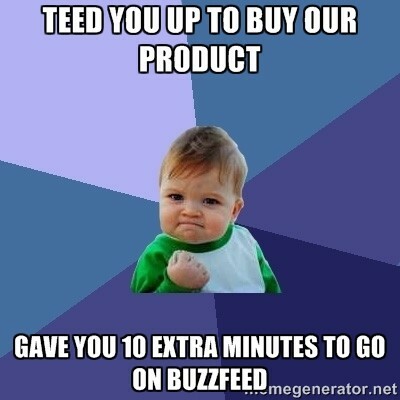 They can just visit your website or watch your pre-recorded online product tour. The true value of a live product demo is that you can customize it to their specific wants and needs. A successful product demo is about revealing how the prospect will benefit from your product. Which problems will your product help them solve? Which objectives will it help them achieve? 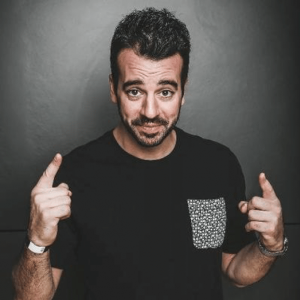 The most important thing you can do to improve your product demos is to dedicate the first couple of minutes to asking questions that will help you understand what your audience hopes to get out of using your product. Why did she sign up for a demo? What does she hope to gain from it? How will she evaluate your product? What other solutions is she currently considering, and why those in particular? Which problems does she hope your product can help her solve, what are the goals she wants to achieve? How is she currently dealing with these issues? What are the biggest pain points she has with that arrangement? What are her main concerns about your product? Never give a product demo until you know the specific reason the prospect signed up in the first place. Too many sales reps throw darts in the dark, hoping that the features they’ll talk about are the features the prospect cares about. This almost never happens. Always make her understand why what you’re showing her is relevant to her. Start with the end in mind. Where do you want this demo to go? Why are you spending time demoing to this prospect? You want her to buy your software! What are the steps that will take you there? Keep those in mind and keep working your way towards them. Bad product demos start out in a very textbook-like manner, with the goal of teaching the prospect the basics of the product first. Instead, make a splash by starting off with a spectacular opening, something that will impress the prospect and make her want to have that particular feature. Why wouldn’t you kick things off with a bang? Remember, your prospect’s attention is incredibly valuable, and just because she puts you in her calendar for half an hour doesn’t mean you own her attention. You continuously have to prove that you’re worth her attention; you continuously have to earn it. Even if she’s sitting in front of the screen listening to you talking, the next distraction is just a mouse click away. Make the most of her attention before you risk the chance of losing it. Start the demo with something that wows her. The first thing you show her will have a bigger impact and more staying power than you might think. According to a well-studied phenomenon in psychology called the Primacy Effect, the first thing you start out with during a presentation will stick in your audience’s mind much more vividly than what comes after. A lot of salespeople try to keep the highlight of the demo for the end. They want to finish with a spectacular finale like a Hollywood movie. But if you keep all the exciting stuff for the end, what will you start with? The boring stuff! Too many times the boring stuff will cause you to lose the prospect’s attention long before you get to the grand finale. In addition to starting strong it’s incredibly important to keep the demo short, condensed, and relevant. Limit yourself to the features and functions that are specifically relevant to the prospect. 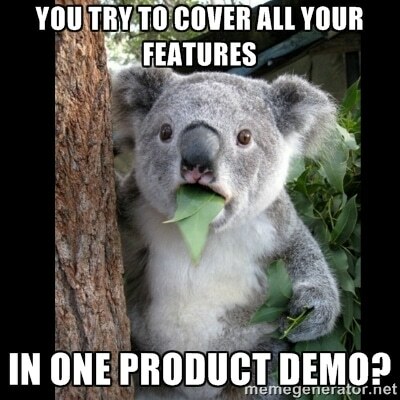 Too many times when people are giving a product demo, they assume that more is better. Look at all these great features we have! And all these things you can do with our product! Look the multitude of possible configuration choices! What do you think that kind of product demo typically results in? The prospect feels overwhelmed and gets the impression that your product is too difficult to use! Instead, concentrate on showing her the 20% of your product that will get her 80% of the results she wants. When you’re giving a demo, make it a two-way conversation between you and the prospect. Regularly engage her and elicit responses by asking questions that help you gauge her level of interest. If you get a sense that she’s disengaged or not interested, don’t just ignore it. This happens all the time: a sales rep notices the prospect isn’t interested in what he’s currently talking about and he just keeps talking, except at a higher speed to get through it faster! Don’t do that. It’s stupid. Continuously ask these questions to keep the prospect engaged. Sometimes a prospect will interrupt you with a question that has the potential to derail your demo. Rather than allowing that to happen, just open up a notepad file and jot the question down there. This way she sees you’re going to respond to her questions later (which makes a stronger impression than you just saying you’ll get back to them). This is particularly valuable if your audience consists of several people, perhaps including someone from the IT department, who is interested in asking you lots of highly technical questions nobody else in the room cares about. In such a case, park the questions in the notepad, tell the IT person you’ll save these for a separate conversation, and jot down her email address or phone number. 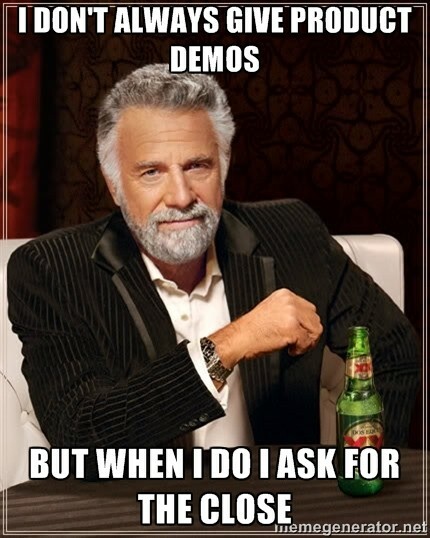 What do you do at the end of your demo? What’s the only thing the prospect will remember more than the beginning of your demo? The end of your demo! This is known as the Recency effect — people will remember the last thing you show or tell them more vividly than the things leading up to it. Which is why you should finish strong! Keep your strongest and most impressive demonstration points for the beginning and the end. No, no, no! It makes me want to cry. Ask for the close! Even if you get a “no” on the phone, you can at least initiate the next step and ask her why. What’s missing? What else needs to happen? What’s in the way of moving forward? The best person to study if you want to improve your product demo success rate is not some sales coach — it’s you! Regularly review your own product demos and listen to yourself. How does the tone of your voice sound? What can you do to improve? How could you have handled an objection differently? Reviewing your demos will help you look at them from another perspective. You’ll have more available mind space than during the live interaction and can think differently about your responses and your ways of serving the prospect. The most important thing to keep in mind is that your demo is about demonstrating value to your prospect. It’s a sales presentation! The outcome you want is to get the prospect to a buying decision. There are plenty of little tweaks and improvements you can do over time, but first of all, take a step back and look at the big picture: did you structure your demo so that it naturally leads to a sale? Want to join a free webinar with live Q&A on how to give successful product demos? Claim your free seat now.